"We always have had and still have great respect for President Mubarak," President Shimon Peres said on Monday. "I don't say everything that he did was right, but he did one thing which all of us are thankful to him for: he kept the peace in the Middle East." "Who is advising them, he asked, to fuel the mob raging in the streets of Egypt and to demand the head of the person who five minutes ago was the bold ally of the president ... an almost lone voice of sanity in a Middle East?" "Whatever the motivation was in Washington, the rough handling of Mubarak will have long-term implications. Egypt is a critical country. The Suez Canal, that connects the Mediterranean Sea to the Indian Ocean, runs through its territory. With Egypt in hostile hands, how will the U.S. reinforce the Persian Gulf from Europe? Intercontinental air routes fly over Egyptian territory, as well. But the real problem will be the reaction of other American allies in the Middle East. What kind of signal did Gibbs’ threat about cutting aid send to King Abdullah of Jordan or to President Saleh of Yemen, as well as to other allies in the Persian Gulf? Did it mean that as soon as an Arab leader gets into trouble, he starts to get disowned? Egypt had its problems, but the approach taken towards this old U.S. ally will have implications across the Arab world in the months ahead..."
"Throughout Asia, Africa and South America, leaders are now looking at what is going on between Washington and Cairo. Everyone grasps the message: "America's word is worthless ... America has lost it." Yediot Ahronot columnist Eitan Haber, who was a top aid to Yitzhak Rabin, wrote in a column that appeared Monday, that this sends a dreadful message to Israel. "Obama threw Mubarak to the dogs.....America, which waves the banner of 'citizens rights,' 'democracy,' and 'freedom of information,' turned its back in a day on one of its most important allies in the Middle East. Obama sold Mubarak for the pot of lentils of popularity among the Egyptian masses". "Our conclusion in Israel needs to be that the man sitting in the White House is liable to 'sell' us over night. The thought that the US might not stand by our side in the day of need causes chills. God help us." "I think that the Americans are making a mistake. if I may point this out to the Americans....They made a different mistake when they didn’t support the demonstrators from the opposition in Iran. They should have supported them with much broader support. Much more massive support. Because the relationship between Iran and the United States is like the relationship between two enemies. Certainly not two lovers. There is an important strategic relationship between Egypt and the United States. Egypt holds an important role in American policy. And the way that President Obama and Hillary Clinton both abandoned Mubarak is very very problematic and hints, in my opinion, with regard to other allies. For example Israel. Those such things could take place under harsh conditions also for us and also for others. They erred. Because they should have talked about a transition process.They should have demanded reforms from Mubarak. They should have demanded from Mubarak a change of the government but they didn’t need to say “Mubarak – you are finished. And now hand over, in an organized way, the regime to those who come after you.” They should have supported Mubarak but demanded from him a much sharper demand and I think that he would have responded and carried out all the reforms he needed to carry out." Deputy minister for Galilee and Negev development Ayoub Kara told visiting former Arkansas governor Mike Huckabee, a likely Republican US Presidential candidate, that Obama needed to understand that "supporting the masses carrying out a revolution in Egypt is like support for the Moslem Brotherhood which is likely to take Mubarak's place." "It needs to be understood that if the Egyptian government will fall, the Muslim Brotherhood will take its place, and that will cause even worse problems not only for the Middle East, but for the whole world." "While it was clear Obama wanted to see democracy established in the Middle East, "anyone with eyes in his head sees that there is no worthy alternative now to Mubarak, and those pushing the masses toward revolution are the Muslim Brotherhood." In a joint press conference with visiting German Chancellor Angela Merkel on Monday, Prime Minister Benjamin Netanyahu said Israel will work towards achieving peace with the Palestinians, but stressed that the sides must "sit together and try to resolve the difficult and complex conflict." "Abu Mazen (Palestinian President Mahmoud Abbas) is 10 minutes from here – in Ramallah. I can go to him and he can come to me. At the end of the day there is no other way to secure peace." "Of course we want to ensure stability in the region so that this peace will be able to take root." "The conflict is not about the (West Bank) settlements; it is about the settlements called Tel Aviv, Haifa, Jaffa. This is why we expect that as part of a permanent agreement the head of the Palestinian Authority will come out and say 'the conflict is over; we recognize a Jewish state and the end of the conflict.' The (Palestinian) refugees will not pour into the State of Israel." Addressing the uprising in Egypt, Netanyahu told reporters that Israel was following the developments with "concern and vigilance, in the hope that peace, stability and security will be maintained." "Our real fear is of a situation that could develop ... and which has already developed in several countries including Iran itself, repressive regimes of radical Islam." "Although the protests may not be motivated by religious extremism in a situation of chaos, an organised Islamist body can seize control of a country. It happened in Iran. It happened in other instances". During his meeting with Merkel, Netanyahu called to tighten sanctions against Iran and said all options remain on the table. "I told the chancellor that over the past 16 years there has only been one year in which Iran suspended its nuclear program, and that was when (Iran) believed the US would resort to the other option. That was in 2003". Merkel agreed, saying Iran's nuclear program "poses a threat to Israel and the entire world. Germany took the necessary measures to toughen the sanctions, and we will continue doing so at the European Union in the coming weeks." During a visit to the Mount of Olives for a cornerstone-laying ceremony in a Jewish east Jerusalem neighborhood, likely US presidential candidate Mike Huckabee asserted that Israelis should be able to live "anywhere in Israel they wished to live." "It is inconceivable in many ways that we would have to even argue and debate whether or not Israelis could live in Israel, not just in parts of Israel but anywhere in Israel they wished to live, I cannot imagine as an American being told that I could not live in certain places in America because I was Christian, or because I was white, or because I spoke English. I would be outraged if someone told me that in my country, I would be prohibited and forbidden to live in a part of that country, for any reason." American Academy Award winning actor Jon Voight and Science and Technology Minister Daniel Hershkowitz also took part in the ceremony. Voight said during the ceremony that he is "very proud to be here with all of you who stood for justice and the legacy of the Jewish people." "When I see you, I think of all the great ones, for so many centuries, who had a dream to pass on the legacy to the next generation, And now you are here, this is your time, and you are doing what you should be doing, which is to prepare the next generations and to be the hope of the world that you are. I love you all." Later Huckabee visited the site of the Shepherd Hotel in Sheikh Jarrah. The hotel was demolished to make room for another Jewish neighborhood. He told reporters the US should be more concerned about Arabs building bombs than Jews building bedrooms. GOP Presidential hopeful Huckabee: U.S. solidarity with Israel is organic; Any threat to Israel is a threat to the U.S.
Mike Huckabee, who is running neck-and-neck in US polls with Mitt Romney as the frontrunner for the Republican presidential nomination, arrived in Israel Sunday, met with Prime Minister Binyamin Netanyahu on Monday. "Any threat to Israel is a very real threat to the United States,And one of the reasons I come here is because I want to be an ambassador in my own country, to help explain that our solidarity with Israel is not merely organizational, but it is organic, and that we cannot afford to allow Israel to be threatened." "I don’t see why bedrooms for their children built by Jews on a hilltop in Samaria pose a threat to world peace,It's the lack of construction that is irrational, not the opposite... Those who aim their rifles at Jewish babies are irrational; the danger is not the weapons, but the hatred behind the weapons." "Why should Israel give any territory to people who don’t recognize its right to exist?". "The events of the past few days in Egypt have created a very tenuous situation, not just for Egypt, not just for the Middle East, but for the entire world, and the destabilization of that nation has the potential of cascading across the globe. Huckabee is scheduled to tour Jewish neighborhoods in east Jerusalem in the afternoon, and tour settlements in the West Bank on Tuesday, and has brought actor Jon Voight with him to Israel. (Aluf benn-Haaretz).Egypt's revolution is understandably causing anxiety in Israel. The nightmare scenario of a collapse of the Mubarak regime and creation of an Islamic republic across the border has for years haunted Israel's leaders. Prime Minister Benjamin Netanyahu spoke yesterday of "efforts to maintain stability and security in our region," succinctly summing up Israel's change-averse foreign policy. Israel cannot influence the upheavals in the Arab world, but it must not settle for expressions of concern voiced by anonymous security sources or by seeking refuge behind the worn barricades of "there's no partner for dialogue" and "we always said you can't trust the Arabs." The state would do better to look beyond them and to spy out the hidden opportunity in the disruption of the old regional order. If Netanyahu plays his cards right, he could leverage the fall of neighboring regimes into a significant improvement in Israel's relations with the United States. After a few days of indecision President Barack Obama rallied to the side of the protesters and publicly distanced himself from Hosni Mubarak. Obama wants to be popular among the citizens of Arab states at the expense of their leaders, as he tried to do in his Cairo speech some 18 months ago. He is betting that the new regimes will be grateful and will continue to rely on Washington for diplomatic and military support. But he is taking a risk: What if the revolution doesn't stop at the moderate interim stage and keeps going till it reaches Muslim extremism? And what will the United States do in the interim phase, when the Middle East is sunk in uncertainty? When Obama and his advisers look at a map of the region, they see only one state they can count on: Israel. The regime is stable, and support for America is well-entrenched. Obama may dislike Netanyahu and his policy toward the Palestinians, but after losing his allies in Turkey, Lebanon and Egypt, and with the uneasiness gripping his friends in Jordan and the Gulf, Washington can't afford to be choosy. It will have to move closer to Israel, and for another reason as well: An anxious Israel is an Israel that is prone to military adventures, and that's the last thing Obama needs right now. Now is the time for Netanyahu and Defense Minister Ehud Barak to justify their claim that Israel is a "villa in the jungle," the West's outpost in the Middle East. They should use the regional crisis to heighten security and diplomatic cooperation with Washington. This weekend's phone conversation between Obama and Netanyahu, after a prolonged estrangement, was the first sign of their awareness of the opportunities represented by the crisis. Today German Chancellor Angela Merkel, who has forged close ties with Obama, arrives in Israel. Netanyahu could use her as a channel of communication to the White House and give her the honor of restoring relations between Jerusalem and Washington. It's Netanyahu's opportunity. Bolton points out Egypt’s outlawed Muslim Brotherhood, which promotes the Islamist ideology employed more violently by Hamas and other terror groups, stands to gain despite being a late comer to the revolt. “The overthrow of the Mubarak regime will not by any sense of the imagination lead to the advent of Jeffersonian democracy,The greater likelihood is a radical, tightly knit organization like the Muslim Brotherhood will take advantage of the chaos and seize power". Egyptian Revolution Debunks that Israel is the Cause of Mideast Instability, It's the Economy, Stupid! (Herb Keinon-Matzav).From an Israeli perspective, one of the most striking elements of the evolving revolution in Egypt, Tunisia and other parts of the Arab world is the degree to which all of this is not about us. Why? Because Middle East instability is not about us - it is about them. It is about Arab unemployment, and Arab poverty, and Arab despair of a better future. True, there is hopelessness in the Arab world - but the source is not the Arab masses concern about the Palestinians; the source is the Arab masses concern about their own lives, their own unemployment and their own lack of freedoms. Fix that and you get stability; ignore that, and you get revolution. When WikiLeaks began publishing US diplomatic cables in November, the world got a good glance at the degree to which the Arab leaders themselves did not see Israel - but rather Iran - as their main threat and the primary source of regional instability. Now on the streets of Cairo, Tunis and Saana, the world is getting a good glance at what the people see as the main threat - their own governments. U.S. Democrats and pro-Israel lobbies slammed on Thursday comments made by newly elected Republican Senator and Tea Party representative Rand Paul, son of well known anti Israel republican Congressman Ron Paul, who suggested that the United States should halt all foreign aid including its financial aid to Israel. In response Liberal pro-Israel (?) lobby J Street said in a statement that it was “alarmed” by Paul’s suggestion. “Senator Paul’s proposal would undermine the decades-long bipartisan consensus on U.S. support for Israel. Any erosion of support should concern Israel’s friends on both sides of the political aisle, and we call in particular on leaders and donors in Senator Paul’s party to repudiate his comments and ensure that American leadership around the world is not threatened by this irresponsible proposal". “Paul's suggestion is negligent, shortsighted, and just plain wrong, “foreign aid in general, and aid to Israel in particular, is crucial to Israel's security and its pursuit of peace. Senator Paul's statement is yet another illustration of how the Republican Party continues to grow increasingly out of touch with the values of the vast majority of the American Jewish community." “Israel is the only democratic nation in the Middle East and one of our most stalwart allies A stable and secure Israel is in our national security interest and has been a staple of our foreign policy for more than sixty years. Using our budget deficit as a reason to abandon Israel is inexcusable. It is unclear to me whether Rand Paul speaks for the Tea Party, the Republican Party, or simply himself”. "We share Senator Paul's commitment to restraining the growth of federal spending, but we reject his misguided proposal to end U.S. assistance to our ally, Israel. "Moreover, based on his comments in an interview with CNN, we are concerned that Senator Paul may not grasp the fundamentals of our alliance with Israel. In 2007, the U.S. and Israel signed a ten-year 'Memorandum of Understanding' (MoU) to govern U.S. assistance going forward. A critical aim of the MoU was to preserve Israel's qualitative military advantage. Accordingly, any concern that U.S. assistance might undermine Israel's security is groundless. "We are heartened to know that, with very few exceptions, congressional Republicans understand and appreciate the importance of this alliance to America's national security. And we are confident that few - if any - of Senator Paul's Republican colleagues will cosponsor a plan that reneges on an agreement with a critical ally." (The Daily Caller).In a wide-ranging interview for a profile to be published by The Daily Caller next week, Israeli Ambassador to the United States Michael Oren told TheDC that despite reports that Iran’s nuclear program has experienced serious setbacks, the Islamic Republic remains a pressing threat. When asked whether the comment reportedly made this month by lionized outgoing Mossad chief Meir Dagan that the “soonest Iran will have a nuclear device is 2015, if that,” means Iran is no longer the immediate threat it was once thought to be. Asked whether the ongoing pro-democracy, anti-government demonstrations in capitals across the Arab world were welcomed by Israel, Oren responded cautiously, saying while Israel “welcomes democratization,” it is concerned about the stability of neighboring states crucial to its security. Oren explained that the Israeli government is particularly worried that the popular uprisings will be hijacked by Islamists. “We are concerned lest the uprising in Tunisia goes the way of the uprising in Iran in 1979 — what began as a sort of secular, very diffuse, popular movement was rather quickly hijacked by Islamic extremists because they are the most organized and best-funded of these groups. And there very focused. They know exactly what they want. And it’s always a danger in the Middle East that these movements can be hijacked”. Asked what he thinks of the recently leaked “Palestine Papers,” which some contend show that the Palestinians were willing in 2008 to make major concessions for peace, Oren initially said that documents didn’t reveal very much other than the fact that the current Palestinian position refusing to have face-to-face peace negotiations without an Israeli settlement freeze is a farce. “I don’t think they reveal very much, In terms of the Palestinian position, I think they tend to reveal the settlement in Jerusalem issues that have been very prominently – that had been portrayed as being major obstacles were not obstacles for the Palestinians in previous rounds of peace talks if you believe the veracity of these documents, so that’s significant”. Vice Prime Minister and Minister for Regional Development, Silvan Shalom, posted a video clip to his YouTube channel on Tuesday in which he addressed the dangers of the latest political developments in Lebanon. The Vice Prime Minister also reiterated that Israel would not take any measures against Lebanon unless provoked by Lebanon first. Earlier on Tuesday, the Lebanese parliament gave Hizbullah nominee banker Najib Makati a solid majority of 68-60 to replace caretaker Prime Minister Sa'ad Hariri. While Hizbullah chief Hassan Nasrallah insisted that his organization will not lead the government, the terrorist organization's political party has been increasingly pulling Lebanon's political strings the past several years. Likud Minister Erdan praises 'Palestine papers': "The truth comes to light"
(Jpost).Environment Minister Gilad Erdan and candidate to serve as Israel's ambassador at the UN, speaking in the Knesset plenum as the official representative of the government, praised what the two media outlets call "the Palestine papers." "When the leaks of Al-Jazeera revealed what the Israeli and Palestinian sides were willing to concede, I saw it as a great blessing, When the truth comes to light, it is always a good thing. In the merit of Al-Jazeera's revelations, we know more of the truth." Erdan complained that in past peace processes, Palestinian leaders would say one thing to the world and the opposite to their people. He said ignoring what former Palestinian leader Yasser Arafat was telling his people in Arabic cost thousands of lives. But he said that now what the Palestinian leaders said behind closed doors has become part of the public record. The minister also complained that the Hebrew press had adopted the efforts of Al-Jazeera to harm the Palestinian Authority and help Hamas by downplaying the Israeli concessions that were revealed while inflating Palestinian concessions. “Livni and Kadima have been trying to advance a false narrative that, had the election not taken place, an agreement would have been achieved, But Livni has not said what her magic formula would be to reach peace after the Palestinians rejected all her concessions". While Erdan was praising Al-Jazeera, MKs on the extreme Right and Left were condemning the network. MK Afu Agbaria (Hadash) accused Al-Jazeera of seeking to help Prime Minister Benjamin Netanyahu by harming both the PA and Opposition leader Tzipi Livni. "We need to ask ourselves who benefits from these reports,Only the government of Israel and Benjamin Netanyahu." Prime Minister Benjamin Netanyahu on Wednesday said the world is remembering the Holocaust but it is not doing enough to condemn Iran and its anti-Semitism. The prime minister spoke at a special Knesset session marking International Holocaust Remembrance Day that will be observed on Thursday. "The international community, has not put into practice the lessons learned from the horrors of the Holocaust." "One thing is clear. The fact that global anti-Semitism is increasing is a well-known phenomenon. New anti-Semitism is washing over the world and it is important to fight it." "There is an ayatollah regime, which is a member of the UN, and it knowingly and openly calls for the elimination of at least another six million Jews, and yet nobody says a word. Here and there they mention it, but where is the fury, the rage, the international uprising that should have come from the advanced international community against clear statements calling for the destruction of the same people? It doesn't exist." "There are many good-hearted people and countries around the world. They feel in their hearts what I think, but that's not enough. Facing a regime which calls for our destruction and which is arming itself with weapons of mass destruction, a stronger mobilization of countries should have emerged." Knesset Speaker Reuven Rivlin also spoke at the session, saying: "The world remembers, but is silent". "Six years after the world established International Holocaust Remembrance Day and vowed to remember - the serpent of destruction again raises its head, It turns out that in complete contrast to the hopes of the Zionist movement, an old anti-Semitism is emerging again. Today, we're not talking anymore about secret protocols, so tomorrow no country can claim that it didn't know and didn't hear. The snake has announced its intentions with the UN, and today its venom is aimed at the entire free world. So just remembering the Holocaust is not enough." The Iranians say that it's against the Zionists, anti-Zionism. It was Martin Luther King who burst that bubble better than anyone else. He said, and I quote: "When people criticize Zionists, they mean Jews. You're talking anti-Semintism!" Opposition leader Tzipi Livni condemned the statements of both Netanyahu and Rivlin. "It is forbidden to compare the situation of Israel to that of the Jews of the Holocaust," she said. "We always have the Holocaust in mind and our leaders must justifiably ask themselves if we recognize a threat in time and how to act. But parents who ask themselves what they would do if they lived at that time must not be given the feeling that Israel is in a similar situation. Israel is not defenseless or in exile alone against evil that tried to destroy them because of who they are." "After learning of J Street's current public call for the Obama Administration to not veto a prospective UN Security Council resolution that, under the rubric of concern about settlement activity, would effectively and unjustly place the whole responsibility for the current impasse in the peace process on Israel, and--critically--would give fresh and powerful impetus to the effort to internationally isolate and delegitimize Israel, I've come to the conclusion that J-Street is not an organization with which I wish to be associated. America really does need a smart, credible, politically active organization that is as aggressively pro-peace as it is pro-Israel. Unfortunately, J-Street ain't it." Ackerman is no right-winger, I can say that. But he is a friend of Israel and a sincere advocate for a resolution of the Palestinian-Israeli conflict. He has delivered a well-deserved knockout punch to the left-wing J Street and its like-minded comrades, making clear that simply slapping "pro-Israel" on your stationery doesn't make you so. If not Ackerman, with whom does J Street expect to have influence? Precisely as I have argued, Ackerman makes clear that support for United Nations condemnation of Israel only gives "powerful impetus to the effort to internationally isolate and delegitimize Israel." If you listen carefully, you might hear the fig leaf of respectability for J Street and similar pro-condemnation advocates fluttering to the ground. David Frum/ What Palestinian concessions? Divide the country along the 1967 armistice lines. The Palestinians get the West Bank and Gaza. Israel gets Israel. Jerusalem is shared somehow. The Palestinian state is disarmed, so that Israel gets security. The international community is mobilized, so that the Palestinians get money. This answer seems so compelling to Americans that you'll often hear U.S. experts on the issue say, "Everybody knows what the answer has to be." "Everybody knows"? Not so fast. The Palestinian leaks show the Palestinian Authority leadership trying to work their way to the answer that "everybody knows." But the secrecy surrounding the documents -- and the reaction to the leak -- confirms the Israelis' worst fear: The Palestinian population does not, in fact, "know" what "everybody knows." And a Palestinian leadership that did "know" what "everybody knows" is now being reviled by its own population as traitors and sell-outs. What, after all, are the big, shameful concessions contained in the documents? Where are the wounds to Palestinian national pride? • The documents as reported demand Palestinian sovereignty over almost all of historic Jerusalem, including the Western Wall, the holiest site in Judaism. • The documents demand Palestinian control of lands equal in territory to the 1967 lands. Any border adjustment to reflect Israeli settlement activity would have to be balanced by an equivalent surrender of Israeli land to the new Palestinian state. • Even after the Palestinians get their state on the other side of the 1967 line, the documents demand some kind of recognition of a Palestinian right to "return" to the Israeli side of the line. At one point, the documents suggest that the Israelis be required to resettle 100,000 Palestinians inside Israel. If these ideas had been accepted as the basis of a final treaty between Israel and Palestine, every Middle East expert in Washington would have agreed that the Palestinians had done very, very, very well for themselves. And yet, it never happened. It did not happen in very large part for exactly the reason now confessed by angry Palestinians themselves: because the actual demands of the Palestinian population are so much greater than any diplomat can gain. The leaked documents take large steps toward recognizing reality as Americans see it. Yet these steps had to remain a desperately guarded secret for exactly the reason we are seeing now: If a Palestinian leadership publicly admits what "everybody admits," that Palestinian leadership will be discredited and repudiated. Yasser Arafat believed that his people would not accept peace on such terms, which is why Arafat refused to sign a similar peace in 2000: He said it would be signing his death warrant. That refusal triggered another war, the Second Intifada of 2000-03, which ended in disastrous Palestinian defeat. Yet even after that loss, dissident politicians within the Palestinian leadership believe that their people still will not accept peace on the terms "everybody knows," which is why one of those politicians leaked these documents. That politician expects that disclosure will destroy the current Palestinian leadership and open the way for new leaders who will continue the long war for the old hopeless goals. From the outside, this Palestinian behavior looks utterly irrational. You can't always get the deal you want. Still, some deal is better -- you'd think -- than no deal at all. And there is no deal that will give the Palestinians the things their leaders promise them. Palestinians will not be returning to Israel. Palestinians will not be getting the Western Wall. The suburbs built around Jerusalem will not be unbuilt. The deal on offer in 2020 will be worse than the deal on offer in 2010. Why not end the conflict today? The conflict is not being ended because the outside world supports and subsidizes the conflict. Palestinians who have lived in Lebanon since 1949 are not Lebanese. Ditto Palestinians who have lived in Syria or Jordan. They receive international aid on the condition that they remain refugees forever. They command attention only to the extent that they do not relinquish their grievances. Everywhere else on the planet, the world community insists that wars must end. This one war is the war that the international community pays to continue. And when -- at long last! -- some Palestinian leaders take the tentative steps toward peace on more realistic terms, they must do so in desperate secret. They know what would happen if the deal ever emerged into view. They'd lose their public. As has happened. When people say that the Middle East peace process is all process, no peace, here is why: because it is only so long that the process reaches no result that the people in charge of the process on the Palestinian side can remain in charge. The Likud faction on Monday decided to support the establishment of a parliamentary inquiry commission into the activity and funding of Israeli left-wing organizations. The decision passed by a majority of seven to six, which gives the Knesset House Committee the support needed to draft an outline for the move next week. During the meeting, Prime Minister Benjamin Netanyahu scolded Meridor for saying that Likud has become an undemocratic party. Meridor said Likud was making a mistake by supporting the investigation. "The inquiry commission will be covered by foreign media outlets and cause us harm. The idea of investigating human rights groups will serve those who work to delegitimize Israel. "A law which obligates (organizations) to submit information regarding their sources of funding already exists. The Shin Bet and police can investigate if a problem arises. The Knesset is not an investigative body," he added. Netanyahu said in response, "This is a distortion of the truth. We are committed to a democratic and liberal regime, as well as to freedom of speech. This discussion is proof of that." Minister Moshe Ya'alon said he supports an investigation against leftist groups "particularly because of the involvement of foreign countries in the activity of these organizations in Israel. "Arab elements and European governments are funding (leftist groups) against Israel's interests. If an organization calls on youngsters not to serve in the IDF and it is funded by European governments – this is not right, and it cannot be presented as freedom of speech". There is a debate going on in the Media, and the WH weighed in on it too, if the latest Al Jazeera Palestine papers leaks are reliable, whom it harms and what an impact it may have to the peace process. Some have suggested that it is a blow to the 2 State solution, some see it as a blow to the moderate (if there is any) Fatah Leadership weakened against the Hamas in Gaza, some see it as a way to attack Israel for not compromising or bending towards the PA generous offers, but some may see it as a wake up call to the World, to the peace promoters and to the Israeli citizens. So here’s my take on it, as i have tried to swing with the wind of leaks but take the most out of it for Israel's advantage, if it had any until now in the Global battle for minds. If this is proven to be an honest report, all I can say that the Palestinians, the left peace camp, the Opposition and the Mainstream Media, got exposed, the masks were removed from their face, and no make up will remove or hide the dirt splashed on their face. PA negotiator Saeb Erekat as reported was willing to concede: French Hill, Ramat Alon, Ramat Shlomo, Gilo, Talpiot, and the Jewish Quarter in Jerusalem’s old city, all these Jewish neighborhoods that are marked as settlements, that undermine the pace process, were recognized by the PA as part of Israel in any agreement and proposed to PM Ehud Olmert as an obvious concession, hence when Netanyahu took office, these areas suddenly became an obstacle and a in middle of the road rock for the peace process, the PA demanding from Netanyahu a total freeze and the US admin setting up an ambush, bringing the relations to a new low. Without going into specifics, because a lot of what I read seems to be shocking in my eyes, what Livni and Olmert offered, while having no mandate, and as Professor Barry Rubin brings out on his site, the truth behind these leaked documents. So first as a starting point I would say, that If it is proven that the PA recognized E. Jlem neighborhoods as part of Israel, were willing to recognize Israel as a Jewish state, despite PM Olmert never mentioning or bringing this up ,than they cant or must not be permitted to offer less to PM Netanyahu, and therefore have no right to demand a freeze as pre condition for peace talks, this and more its about time for the US administration in Washington, President Obama to recognize Jerusalem as the capital of Israel, at least the Jewish neighborhoods in E. Jerusalem, Just as the PA did realistically. but here is the thing, despite their generous offer and concessions from both sides, Olmert offered even more then they expected, as of dividing the holy city of Jerusalem,Land swaps and accepting a formal symbolic right of return for 100,000 refugees, despite that open to the heart negotiations - Peace did not happen, the #Palestinepapers prove us once again, that concessions don't advance peace, Peace can only happen if the PA will consider Israel as a legal partner, if they will recognize our historical right to this land, if they will believe not only in their sovereignty, their ability to govern , but the right for the Jews to live in their promised land, and TALK with the Israeli public representative that is the elected government of Israel, then peace may may become a little more realistic. So its still early to determine who are the winners and losers in the long range, but as of now ther are a few Losers: 1) The Left wing peace camp and peace promoters, the Opposition Leader Kadima head Tzipi Livni for attacking Netanyahu on the lack of progress, naming his Gov't a un Zionist govt that endangers Israel's security and existence as Jewish state, when she almost sold out all of our positions. 2) President Obama as he made the settlements the main issue in the peace process, wasted 2 years of downfalls and political blood, that led to what Ben Smith reports in Politico, the Netanyahu Obama relations are not only low but have come to a stage of zero… and for what? For some Jewish neighborhoods that will be recognized by the Arabs as part of Israel but will still be preserved in the US as counterproductive to the US-Israel strong and strategic relationship. 3) Peace that could of given for both people, and for the future generations to come, some hope, security and prosperity. The Winners: I think Prime Minister Netanyahu is the ultimate winner of this situation, not that everything is honey, not that the Status quo is good for Israel, but somehow I would give Netanyahu high marks as Man of the Year, that everything seems to be falling in his favor from unexpected sources, if I only mention- The Wikileaks on Iran, the Iranian nuclear slowdown, Tony Blair strengthening his call by urging to use force to stop Iran's influence in the region, the Settlement freeze demand that Obama dropped in face of his reelection chances getting riskier and getting educated as the years pass by, Barak splitting from Labor, giving the coalition a stronger chance of surviving any political earthquakes, the Turkel inquiry findings on the flotilla and now the Palileaks that proved the world once again who wants peace and who is avoiding progress or not even considering us as a partner for peace. (Noah Pollak -Commentarymagazine). You wouldn’t expect Al-Jazeera and the Guardian newspaper in Britain to do anything but spin the “Palestine Papers” — the leaked transcripts of late Bush administration negotiations between Israeli, Palestinian, and American officials — to the max. And so they have, today, with shocked responses from foreign-policy types. Indeed, an editor at Foreign Policy magazine went so far as to declare on Twitter that the “two state solution is dead” as a result. The Palestine Papers, however, come off badly for the leader of Israel’s opposition, Tzipi Livni, who was then-PM Ehud Olmert’s foreign minister at the time and one of the dramatis personae of the negotiations. Livni’s political liability is that too many Israelis think she isn’t tough enough to be prime minister. She has a tendency to denigrate her own side as a way of ingratiating herself to hostile audiences. To this day, she forcefully criticizes her own country and government while abroad and in front of audiences who have little affection for Israel (see her recent appearance with ABC’s Christiane Amanpour). She seems to think this wins her points for impartiality. The Palestine Papers show her doing much the same in private, offering to collude with the Palestinians to invent pretexts for letting terrorists out of jail and dismissing Israel’s claim to the Golan Heights (“We’re giving up the Golan”). These indulgences may stick in voters’ minds in Israel and make it that much harder for her to dispel the fear that if awarded the premiership, she’ll give the store away. With the Palestinian Authority making an international incident over every plan to build in Jewish neighborhoods in Jerusalem beyond the Green Line, a cache of some 1,600 documents—mostly form [sic] the Palestinian Negotiating Unit—shows that in 2008 the PA was willing to recognize eventual Israeli control over all those neighborhoods, with the exception of Har Homa. This is actually unfair to the Palestinians. They didn’t make construction in Jewish neighborhoods in Jerusalem an “international incident.” That was Obama, who has criticized construction in these neighborhoods repeatedly. There is not much news in the Palestine Papers to anyone familiar with the Annapolis-era negotiations. But they do provide another example of how badly the Obama administration has handled the peace process. (Ben Smith-Politico).For two years, the Obama White House has tried to give Israeli Prime Minister Benjamin Netanyahu the benefit of the doubt as a prospective peace partner — viewing him as a leader who shared U.S. goals but faced tough domestic political constraints that Washington felt obliged to help counter. In recent weeks, in the wake of the latest collapse of American diplomacy in the region around Thanksgiving, a new, more hard-headed view of Netanyahu has become cemented in the West Wing — one that rates the chances of a personal alliance growing between the Israeli leader and President Barack Obama to be just about zero. The notion that the two men could prove a productive diplomatic odd couple has been tossed aside because, in the American view, the worst expectations about Netanyahu’s intransigence have been confirmed. The new view: Netanyahu chose the constraints of a coalition that he steered further right this month, and the U.S. won’t be offering him help, or sympathy, with his domestic politics going forward. Meanwhile, this distinctly non-rose colored view of Netanyahu has taken hold in the White House just as there is growing doubt about whether Palestinian Authority President Mahmoud Abbas can ever be a consistent, strong American ally. The twin conclusions have brought a distinct frost to administration relations with both men — a chill that for now seems likely to freeze the chances for any new U.S. peace initiative in the region. “Every leader faces difficult politics — the question for both sides is whether they’re willing to make tough choices that are in their interests despite the politics,” said a White House official of both Netanyahu and Abbas, the latter of whom has drawn White House ire for what officials described as inconsistent demands. This latest moment of gloom comes as the White House has lost interest in the Middle East for another reason. Obama’s two departing senior aides, Rahm Emanuel and David Axelrod, were personally deeply involved in the Middle East talks, viewing them as historic and politically promising opportunities. They’re being replaced with staffers with little demonstrated interest and few ties to Israel, Bill Daley and David Plouffe. “There’s definitely been a change since Rahm and Axelrod left,” said Zvika Kreiger, a senior vice president of The S. Daniel Abraham Center for International Peace in Washington. Relations with the two Middle Eastern camps deteriorated from different points. The White House began with the view that Abbas was a reliable ally, and Netanyahu a questionable one, as Clinton-era distrust lingered. But early squabbles with the Israelis gave way to a year of apparent cooperation and to Netanyahu’s public embrace of the idea of two states. He agreed to a partial settlement freeze and quietly tamped down the most inflammatory construction on the ground even in disputed Jerusalem — and his aides had, the Americans believed, agreed to a painstakingly negotiated extension this fall, something that never materialized. And the U.S. retains extremely warm relationships with elements of the Israeli and Palestinian governments: Security cooperation with the Israeli military has, American officials say, never been closer; and Abbas is given credit for, at least, protecting his prime minister, Salam Fayyad, whose state-building efforts are seen as the brightest spot in the stalled conflict. But the Thanksgiving collapse of talks launched just weeks earlier with great fanfare — prompted by Netanyahu’s refusal to negotiate on points other than security, and the Palestinians’ refusal to enter the American-led talks without prior concessions — has sent the U.S. into a period of re-evaluation, and of frustration with the two leaders in particular. Minister Binyamin Netanyahu responded to the Turkel Commission report by saying it showed that the blockade of Gaza, as well as the enforcement of the blockade, was legal. Netanyahu’s comments came at a ceremony in the Prime Minister’s Office where he was selecting posters for International Holocaust Remembrance Day. Noting that the modern State of Israel has the ability denied to survivors in the Holocaust, the Prime Minister said critics today pay lip service to Israel’s right to self-defense. “This is what they did when we set up to put up a security fence against suicide terrorists. They actually wanted to take us to an international law court for committing the international crime, so they said, a war crime of putting up a fence against terrorist bombers. “And this is what happened the second time with the Goldstone Report – when we responded, in the most pinpointed way that any army has responded, to the firing of thousands of rockets on our citizens. And this is also what happened last May – when Israel enforced a naval blockade to prevent weapons and war material from infiltrating into the terror organizations in Gaza. (Via Guardian). The documents reveal Palestinian Authority leaders often tipping over into making ingratiating appeals to their Israeli counterparts, as well as US leaders. "I would vote for you," the then senior Palestinian negotiator, Ahmed Qureia (also known as Abu Ala), told Tzipi Livni, Israel's foreign minister, during talks at the King David hotel in Jerusalem in June 2008, as she was preparing for elections in her Kadima party. Given the choice, Livni shot back, "you don't have much of a dilemma." Qureia's comment echoed earlier private remarks by the Palestinian president, Mahmoud Abbas (Abu Mazen), to Ariel Sharon in a June 2005 meeting at the then Israeli prime minister's residence which would have caused outrage if they had been made known at the time. Having listened to Sharon berate him for failing to crack down on the "terrorist infrastructure" of Hamas and Islamic jihad, Abbas was recorded as noting "with pleasure the fact that Sharon considered him a friend, and the fact that he too considered Sharon a friend, every bullet that is aimed in the direction of Israel is a bullet aimed at the Palestinians as well". In an emotional – and apparently humiliating – outburst to Barack Obama's Middle East envoy, George Mitchell, in Washington in October 2009, the senior Palestinian negotiator Saeb Erekat complained that the Ramallah-based Palestinian leadership wasn't even being offered a "figleaf". He said: "Nineteen years of promises and you haven't made up your minds what you want to do with us ... We delivered on our road map obligations. Even Yuval Diskin [director of Israel's internal security service, Shabak] raises his hat on security. But no, they can't even give a six-month freeze to give me a figleaf." All the US government was interested in, Erekat went on, was "PR, quick news, and we're cost free", ending up with the appeal: "What good am I if I'm the joke of my wife, if I'm so weak?" A few months later, in January 2010, Erekat returned to a similar theme with the US state department official David Hale, saying he was offering Israel "the biggest Yerushalayim in Jewish history" (using the Hebrew name for Jerusalem), a "symbolic number of refugees' return, demilitarized state ... What more can I give?" But as became clear even under the earlier, less hardline Israeli government of Ehud Olmert, the scale of concessions offered by Erekat and other Palestinian Authority negotiators – far beyond what the majority of the Palestinian public would be likely to accept – was insufficient for Israeli leaders. The documents show the Israelis conducting themselves in a businesslike manner. In an attempt to show her good faith, Livni is recorded confirming what Palestinians have always accused Israeli governments of doing: creating facts on the ground to prevent the possibility of a viable Palestinian state in the West Bank and Gaza. At a west Jerusalem meeting in November 2007, she told Qurei that she believed Palestinians saw settlement building as meaning "Israel takes more land [so] that the Palestinian state will be impossible"; that "the Israel policy is to take more and more land day after day and that at the end of the day we'lll say that is impossible, we already have the land and we cannot create the state". She conceded that had been "the policy of the government for a really long time". At the end of 2007, though, "it is still the policy of some of the parties but not the government". Increasingly, PA leaders resorted to warning US officials that if they failed to deliver an agreement with Israel, the door would be opened to Hamas and Iran. In October 2009, Erekat told Mitchell: "In no time you will have Aziz Dweik as your partner," referring to the Hamas speaker of the Palestinian parliament, who constitutionally assumes the role of Palestinian president when the job is vacant. PA leaders repeatedly threatened to abandon attempts to negotiate a two-state solution in favour of a one-state option. At the same meeting, Erekat declared that if the settlement of the West Bank continued, "we will announce the one state and the struggle for equality in the state of Israel". But the documents show US officials unmoved by such claims. Why were the Palestinians "always in a chapter of a Greek tragedy", secretary of state, Hillary Clinton, asked at a meeting with Erekat in Washington in the autumn of 2009. (via Al Jazeera English). The most tensed confrontation between the Obama admin and the Israeli government came last year, when the Jerusalem municipality approved 1,600 new housing tenders while Joe Biden, the US vice-president, was visiting Israel. The US responded to the Ramat Shlomo announcement with anger; Biden said it "undermines the kind of trust we need" to restart talks between Israel and the Palestinian Authority (PA). But The Palestine Papers reveal that Israel had no reason to halt construction in Ramat Shlomo. That’s because Palestinian negotiators agreed in 2008 to allow Israel to annex this settlement, along with almost every other Jewish neighborhood – an historic concession for which they received nothing in return. The unprecedented offer by the PA came in a June 15 trilateral meeting in Jerusalem, involving Condoleezza Rice, the then-US secretary of state, Tzipi Livni, the then-Israeli foreign minister, Ahmed Qurei, PA's former prime minister, and Saeb Erekat, the chief Palestinian negotiator. The Israeli side refused to even place Jerusalem on the agenda, let alone offer the PA concessions in return for its historic offer. An Israeli inquiry commission defended the actions of its troops during last year's deadly raid on a Gaza-bound flotilla sailing from Turkey. The nearly 300-page report released Sunday by the government-appointed Turkel Commission said the actions of the soldiers "were found to be legal pursuant to the rules of international law" and that they opened fire in self-defense. The commission, headed by a retired Supreme Court justice, included five Israeli members and two international observers - Brig. Gen. Ken Watkin of Canada and Lord David Trimble of Northern Ireland. "It is possible to determine that the IDF soldiers acted professionally and with great presence of mind in light of the extreme violence which they hadn't expected. "This professionalism was evident in the fact that they continued to exchange their lethal weapons for the less lethal option and visa versa in order to give a response that was appropriate to the nature of the violence directed at them." "The decision-makers didn't have any prior knowledge of the violent reception planned by the IHH members and their inability to identify the intentions of the IHH directly affected the planning and execution of the operation." "The possibility that an organized group, armed with lethal weapons was on board the Marmara and set to take active measures against attempts to board the ship wasn't taken into account." The IDF received a great deal of praise from the Turkel committee for placing senior officers on the scene – including the navy commander. "This increased the chain of command's awareness of the developments as they happened which helped them to receive decisions efficiently, at the right time as the incident developed." "The decision is compatible with the international practice which is used in naval operations, even when not considered an armed confrontation," the report stated. In addition, the commission members wrote that the way the IDF handled the transfer of the passengers to Israel was well done due to the coordination between the governmental offices. The bloodshed drew heavy international condemnation directed at Israel and forced it to ease the blockade on the Hamas-ruled Gaza Strip. The Turkel Commission stressed that it did not find any evidence to the claims Israel was trying to prevent food from entering Gaza in order to stave its population. The members said the Hamas-ruled coastal enclave suffers from a 'lack of nutritional stability', not starvation. They naval blockade is legal in accordance with international law, the commission determined. "The naval blockade imposed on the Gaza Strip – in view of the security circumstances and Israel's efforts to comply with its humanitarian obligations – was legal pursuant to the rules of international law. The actions carried out by Israel on May 31, 2010, to enforce the naval blockade had the regrettable consequences of the loss of human life and physical injuries. Nonetheless, and despite the limited number of uses of force for which we could not reach a conclusion, the actions taken were found to be legal pursuant to the rules of international law." "The imposition and enforcement of the naval blockade on the Gaza Strip does not constitute "collective punishment" of the population of the Gaza Strip." "International law does not give individuals or groups the freedom to ignore the imposition of a naval blockade that satisfies the conditions for imposing it and that is enforced accordingly, especially where a blockade satisfies obligations to neutral parties, merely because in the opinion of those individuals or groups it violates the duties of the party imposing the blockade vis-à-vis the entity subject to the blockade." (Haaretz).Foreign Minister Avigdor Lieberman has drafted a map of a Palestinian state in provisional borders. The map would essentially "freeze the existing situation in the territories, with minor changes," a senior Foreign Ministry official said. The proposal is meant to show that Israel is genuinely interested in progress toward peace, and to force the Palestinians to say whether they really want a state. According to the official, Lieberman says Israel must take the diplomatic initiative by proposing a Palestinian state in provisional borders. This would preempt international recognition of such a state in the 1967 borders, reduce international pressure on Israel and transfer at least part of the state to the Palestinians. "After a Palestinian state has been established in provisional borders, it would be possible to resume diplomatic negotiations and maybe reach agreements on transferring additional territory to the Palestinian state". Lieberman has briefed Prime Minister Benjamin Netanyahu on the project but has not yet shown him the map. Lieberman, the source said, believes that the more time passes, the more people will come around to the idea that the goal for now should be an interim agreement with the Palestinians. The idea is already gaining support in the forum of seven key ministers. Vice Prime Minister Moshe Ya'alon, for instance, shares Lieberman's view that Israel should consider establishing a Palestinian state with provisional borders, simultaneously bolstering the Palestinian Authority and reducing Israeli control over Palestinians' lives. The Foreign Ministry source said Lieberman's map also includes a network of new roads linking the areas under Palestinian control. The map "provides territorial contiguity that would enable the Palestinian state in provisional borders to be viable," he said. At the same time, Lieberman has also ordered his ministry to draft plans to pressure the PA to stop waging diplomatic campaigns against Israel in the UN Security Council, the International Criminal Court and other international forums. According to the Foreign Ministry official, the ministry is finalizing a report that will list all the steps Israel has taken to further economic and security cooperation with the Palestinians, contrasted with all the steps the PA has taken against Israel. The report is due to be completed in another week, after which Lieberman plans to send it to the U.S. State Department and both houses of Congress. He will then ask the United States to threaten to halt financial assistance to the PA if it does not end its anti-Israel campaign. (AFP). Former British Prime Minister Tony Blair urged the West to be prepared to confront Iran with force in order to face the "looming and coming challenge" from the Islamic republic. "It Iran has to be confronted and changed. Iran is a looming challenge. It is negative and destabilizing. It supports terrorists." "I say this to you with all of the passion I possibly can -- at some point the West has to get out of what I think is a wretched policy or posture of apology for believing that we are causing what the Iranians are doing, or what these extremists are doing, we have to get our head out of the sand. They disagree fundamentally with our way of life and will carry on unless met with determination and, if necessary, force." Blair, who regularly visits the Middle East as the Quartet envoy, said that he could see the "impact and the influence of Iran everywhere." (via Yossi Verter-Haaretz)...In this week's Haaretz-Dialog public opinion poll,in first time in 2 years Netanyahu fell below the red line: More than half of the respondents are not satisfied with his performance. only 39% approve his performance as PM, while 54% disapprove. Nevertheless, Netanyahu's tenure is not in danger. If elections were held today, he could easily cobble together a new government. 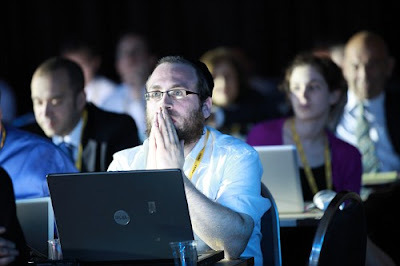 According to the survey, supervised by Prof. Camil Fuchs at Tel Aviv University's statistics department, the Likud/right-wing/ultra-Orthodox bloc would get stronger, with 69 MKs, whereas the center-left bloc would get only 51 seats. Likud gains +5 seats (32 to current 27), Kadima +2 (30 to current 28), Lieberman 15, Shas 11, Barak-Independence party 2, Labor 5. In terms of suitability to be prime minister, Netanyahu trounces opposition leader Kadima MK Tzipi Livni 48 percent to 31 percent. As prime minister, Netanyahu may not be answering to most voters' expectations, but they prefer him to the only alternative. Though Livni succeeded in raking in two more Knesset seats for her party from the Labor Party in the last elections, as per this poll, they are likely to return to Labor once it gets back on its feet, chooses a leader and embarks on a new path. The breakaway by Barak and his pals to form Atzmaut (which means "independence" in Hebrew ) also gave Labor, well, more independence - from those who broke away. If the mutual loathing among the eight remaining MKs were to be converted into energy, it could heat all of Ramat Gan. Ben-Eliezer calls MK Shelly Yachimovich "a turbine of hatred." She considers him worse than Barak. Barak's situation is dreadful. Less than a third of the respondents are satisfied with his performance as defense minister. His years at the Defense Ministry, first under Olmert and now under Netanyahu, may have been Israel's best, security-wise, but this man is now so hated as a politician and as a person that people will not give him credit for anything. His party, Atzmaut, would get about the minimum needed to make it into the Knesset, says the survey. The poll also examined two potential new political forces: Yair Lapid and Aryeh Deri. If either founds a new party, he would get about 7 percent of votes, meaning 8 or 9 Knesset seats. This is an utterly virtual scenario, but it still shows something. The blocs will not be the same again. The MKs were quickly escorted from the hall. At least one had to be physically removed.Knesset Speaker Reuven Rivlin denounced the brief protest, which violated Knesset protocol. “You should be ashamed of yourself. You are a disgrace to Israeli democracy,” he told the protesting MKs as they were escorted from the hall. "Over the next three years, Kadima will continue with their gimmicks while the Likud will remain in power," a Likud official announcement stated. "No air freshener will rid us of the stench of the Kadima party files in police headquarters." Environmental Protection Minister Gilad Erdan was alsoremoved from the Knesset discussion, when he told Kadima MK Yohanan Plessner, "You're acting like an Arab." Labor MK Ghaleb Majadleh, who was leading the meeting, responded that he was a "proud Palestinian Arab" and told Erdan to leave. "There are non-Jews among the citizens of this country. How would we feel if someone said not to sell apartments to Jews? We would have been outraged, and indeed we are outraged when we hear such things in neighboring countries or anywhere else. Such statements should not be made, neither about Jews nor about Arabs. They must not be made in any democratic country, let alone a Jewish-democratic country that respects the moral values of the Jewish heritage and the Bible. Therefore, the State of Israel categorically rejects these things."